If you would like to reserve a fleece from the list below, contact us. All Pitchfork llama fleeces are brushed and blown before shearing. They are extremely clean, free of mats, and healthy. Extraordinary care is taken to avoid second cuts. All are guaranteed to be as described, or we pay the shipping to return it. Samples available, but we do not hold the fleece while you decide. Fleeces marked RESERVED have been spoken for but payment has not yet been finalized. They may still be available if the interested party does not follow through. Fleeces are marked as SOLD when we receive payment. . We accept Paypal, personal check and money orders. Contact us for our mailing address. Shipping (via USPS Priority unless requested otherwise) is extra and depends upon the destination. You can estimate shipping cost from our ZIP code (48473) to yours at the U.S. Postal Service website. Keep in mind that the box will add about 1 lb. to the shipping weight. Fleeces are arranged from fine to coarse on the list below. #1 – 3 ($2 per oz.) are suitable for next-to-the-skin garments. #4 – 8 ($1 per oz.) are better suited for outer garments, felting or rug yarn. They could also be could be de-haired for an extremely soft, lofty yarn. The guard hair has been used to tie trout flies. 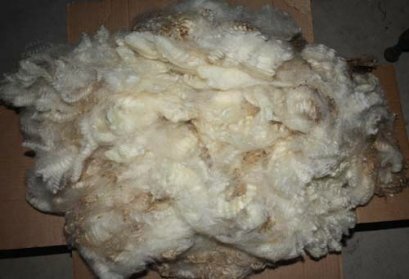 A typical llama fleece is between 1 and 2 lb. of prime (saddle area) fiber.